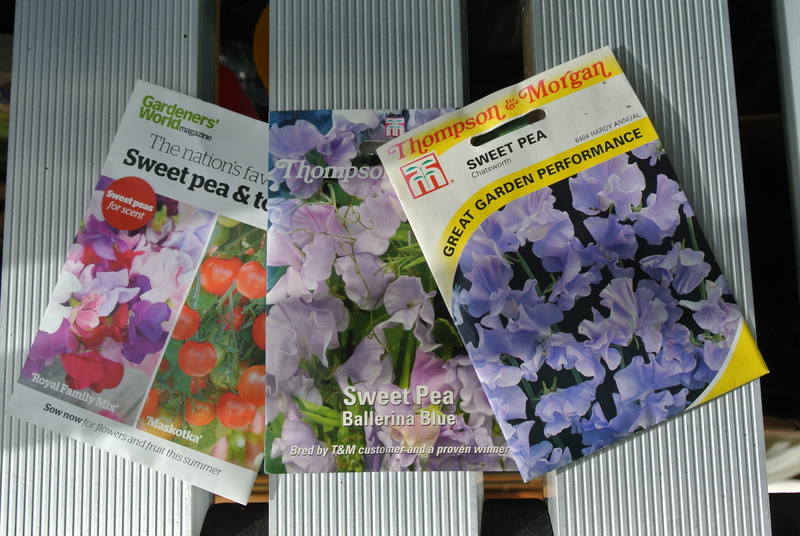 Whilst clearing out the green house this week I found three unopened packets of sweet pea seeds; Ballerina Blue, Chatsworth, both from Thompson & Morgan and Royal Family Mix that came free with a copy of Gardeners World magazine. Admittedly they looked a bit dog eared and faded but since it’s just the right time for autumn sowing and it seemed such a waste to throw them away I decided to pot them up. In my haste I didn’t read the packet properly and forgot the prescribed soaking overnight bit which helps germination, the shell of the seed is tough apparently, so they’re not off to the best start in life. Anyway, as I write this they are on the window sill in the kitchen in their pots so we will know over the next few days if some old seed and less than careful planting will bear fruit. Let me know in the comments what you’ve been up to this week and you can read how to do the sweet pea thing properly here. Reading the RHS advice they recommend scarifying the seeds rather than soaking. I still have a few sweet pea’s outside full with little flower buds. I think they will be very disappointed at the end of the week when the frost starts. I hope I will have time get a few flowers for the kitchen table. I have been peering at the trays like an anxious parent and this morning I can see a couple of shoots. I planted the free Gardeners world sweet peas in the Spring (I soaked them and planted them in toilet roll tubes). They were slow to start but have been wonderful and are in fact still in flower now and I live in the frozen North. I have left them to set seed as I would love to grow them again next year but they don’t seem to want to. Not sure if I left it too late (stopped cutting them in September) but I thought I would have some pods by now… oh well they preformed very well for me so good luck with them. Hello Liz, thank you for taking the time to read and comment. They seem to be germinating, so far so good. I can’t find any Royal Family Mix in this country but it seems to be very popular in America. I am assuming that you have seen this month’s GW? There is big feature on sweet peas and it recommends some seed suppliers. If not let me know and I’ll list them here.